Fans and admirers of Vijay have shattered the records for the film on social media. 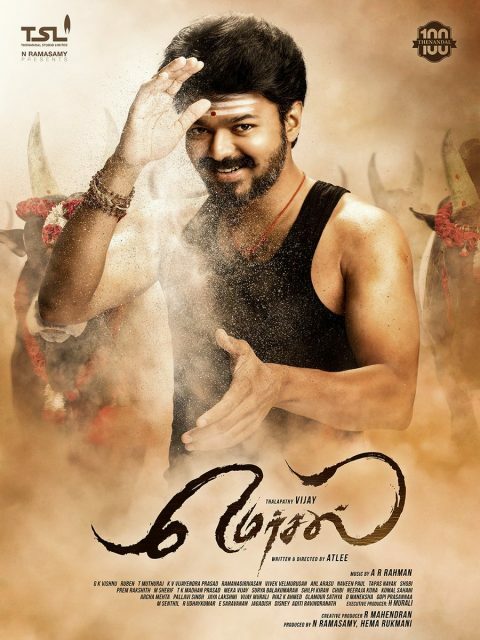 Producers Sri Thenandal films released the first look poster and title of Vijay’s MERSAL on the eve of the super star’s birthday. MERSAL became a mania in no time and social media was abuzz with the poster and MERSAL was all over. Directed by Atlee, MERSAL seems to have Vijay playing a role which might have a connection to farming and jallikattu as the posters indicate. MERSAL seems to be unstoppable at the moment and has already broken few records. MERSAL is now the first Tamil film whose title has been mentioned more than a million times on Twitter since the release of the poster and title. The makers couldn’t have asked for a better start to the promotions path than this for MERSAL. MERSAL also brought in a new change for Vijay in terms of his stature in Tamil cinema. Vijay is now being referred to as Thalapathy instead of Ilayathalapathy which he was crowned by his admirers. The posters and the titles have his name mentioned as Thalapathy Vijay, meaning Commander-in-Chief.